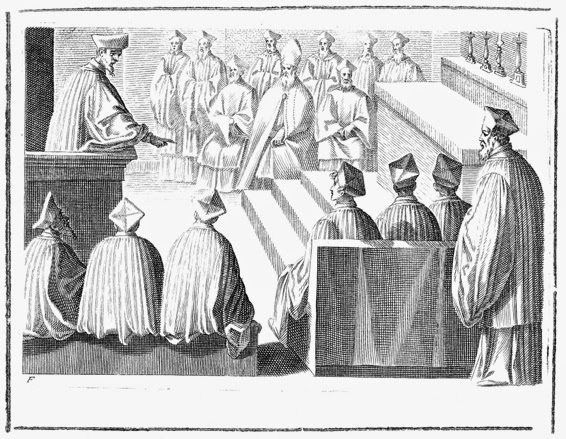 For the second round of sessions of the Extraordinary Synod on the Family, we are reprinting from last year the traditional order for holding a synod, according to the 1595 Pontifical of Clement VIII, both as a matter of general interest, and as something which will perhaps serve to inspire prayers for the good outcome of the current assembly. It is divided into three days, and seems to presume that much of the Synod’s business will be determined by the bishop and his assistants beforehand. The rubrics are given here in summary, omitting several of the less pertinent details, such as the places where the bishop removes his miter etc.